With each passing year, the possibility of Skate 4 somehow seems to grow both more and less likely all at once. Publisher Electronic Arts continues to stay quiet about the subject as it continues to lick its wounds from the release of Anthem, the closure of Visceral, and the Star Wars Battlefront 2 controversy, which suggests a return for the skateboarding series isn't high on its priorities right now. At the same time, the more we wait in patient anticipation, the more plausible a surprise comeback seems. Who knows? Perhaps Skate 4 will be a surprise launch title for the PS5 or Xbox Project Scarlett in a few years time? Or perhaps we're all just chasing an illusory pipe dream that will never come to fruition. Regardless, you'll find all the rumours, news, and potential information about Skate 4 in our frequently updated guide below, including the official statements that EA itself has made about the game (spoilers: they're not very promising). On the evening of June 4, out of nowhere, Skate 3's online servers came back online, mere days before the start of EA Play. Sadly, Electronic Arts had nothing to say during its E3 conference, undermining the significance of that server reboot, but the fact that it happened could still be interpreted as a signal of future intent nonetheless. Going back further in the series' history, Skate and Skate 2 released in 2007 and 2009 respectively, and both sold exceptionally well for a new IP in a niche genre historically dominated by a single franchise. Each title was received favourably by critics and skateboarding fans, too, which quickly established the narrative that Skate was fast on its way to dethroning Tony Hawk as the king of the genre. This success inevitably led to the release of Skate 3 in 2010, and while that title represents the series at the top of its game, it didn’t sell as well as EA had hoped at the time. Tellingly, however, the game only grew in popularity from there, with a surprising peak in sales by 2014 thanks to Pewdiepie. This eventually created more demand than supply for copies of the threequel, at which point EA even reissued new stock to keep sales going. As of today, Skate 3 has sold 2.68 million units worldwide. Still, this clearly hasn’t been enough to yet warrant a fourth game in the publisher’s mind, as you can read on about below. Considering Riccitiello said this only five months on from the release of Skate 3, it reveals how quickly EA had apparently resigned itself to the perceived death of not just their own IP, but the genre at large. This goes a long way in explaining the official radio silence from the company for the next few years, give or take a handful of unsourced rumours. Then, nearly seven years later, something happened. In January 2017, Daniel Lingen, a community engagement executive for EA, tweeted “#skate4” from his personal account, with no context or explanation as to why. You can imagine the reaction that followed, with everyone presuming the tweet to be a savvy marketing tactic teasing the existence of the hashtagged game in question. This appeared to be corroborated by the fact that EA had recently made Skate 3 backwards compatible for the Xbox One, fuelling further speculation about the long awaited return of the series. Unfortunately, EA CEO Andrew Wilson quickly threw cold water on the buzz in an earnings call a few days later, telling investors that the company is “not presently making Skate 4.” Ouch. That was the last official word we’ve had on the game since then, but note the use of the word “presently” by Wilson, meaning EA hasn’t definitively ruled out making another Skate title in future. They still own the IP, after all. Even after Andrew Wilson had attempted to quell any fervor over the now infamous #skate4 tweet, people were still gearing up for a reveal of a Skate game at EA’s E3 press conference in June of 2017. When the conference came and went with not a skateboard in sight, then, there was an inevitable backlash. Even international rapping superstar Tyler, the Creator has repeatedly taken to Twitter to express his desire for a new Skate game. What more will it take, EA?!?! 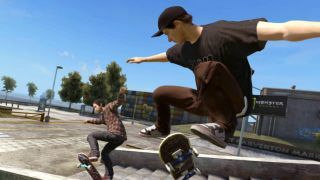 Meanwhile, an independent developer has taken matters into its own hands by working on a spiritual successor to Skate 3, heavily inspired by the simulation-focused mechanics of the series itself. Entitled Sessions, many have decided to declare this upcoming game as the unofficial Skate 4 that people have been yearning for, and it’s due for a 2019 release on Xbox One and PC. Despite EA’s insistence that nothing is happening, the internet has still been actively discussing what they’d like to see in a hypothetical Skate sequel, right down to the nitty gritty details of its currently non-existent design. The main request is more of the same, with a slight return to the responsive realism of Skate 2. Realistic, seamless locations are an important benchmark for Skate veterans, too, as the series’ open environments set its games apart from the more arcade-like zones of Tony Hawk titles. Notable requests in this category include atmospheric cities, online worlds free of loading screens, and “super parks with mega ramps”, because who doesn’t love a good mega ramp? At the end of the day, as long as EA doesn’t turn Skate into a free-to-play mobile game (which, sadly, can’t be ruled out of the question), it’ll be satisfying the desires of many fans who are just dying to see the return of the franchise after seven years of being ignored. We're of two minds about Skate 4. Of course we'd love to see another entry in the series but, at the same time, EA has changed a lot since 2010. If the reality of a Skate 4 game is one which features an overpriced season pass, walled-off pre-order bonuses and distasteful micro-transactions, then we'd instead prefer to just theoretically enjoy the ideal version of Skate 4 that currently exists in our imagination, thank you very much. To be fair, upcoming EA titles like Anthem suggests that the publisher is making a move away from the faustian profiteering of its past and towards a more consumer-first business model, so perhaps there’s hope for a truly fan-servicing Skate game yet. After all of this build-up and drama, then, Skate 4 absolutely has to be worth the wait, but we're willing to give EA the benefit of the doubt if it eventually wishes to make a four-wheeled comeback in the future. What would you love to see in Skate 4? How could EA reinvent the game for current consoles? Let us know what you think by tapping the 'see comments' button below.